Today I want to outline new proposals on which we are work in, a dynamic programme providing facilities for home study to university and higher technical standards, on the basis of a University of the Air and of nationally organised correspondence college courses. He used the term again in a speech at the Labour Party Conference on 1 October, 1963. On 25 February 1966 the Labour government published a white paper, ‘A University of the Air’. George Catlin used the term in 1960 and Michael Young in 1962. [i] Anglia TV broadcast a series called College of the Air in 1963. Versions of the term had been used before prior to this time. Commencing in 1954, Stanford University aired broadcasts to Latin America under the banner of ‘The International University of the Air’. 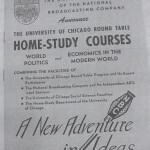 A few years later the Canadian Broadcasting Corporation radio broadcast a series called University of the Air which consisted of recorded lectures. 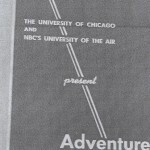 The CBC used the name University of the Air for a television series, again largely consisting of lectures. This was aired early in the mornings between 1966 and 1983. [ii] There was also a pedal-radio network of Schools of the Air in Australia in the 1920s and in the USA the Ohio School of the Air first broadcast in 1929, the Wisconsin School of the Air in 1931, the Wisconsin College of the Air in 1933 and a College of the Air was broadcast from Chicago in the 1950s. 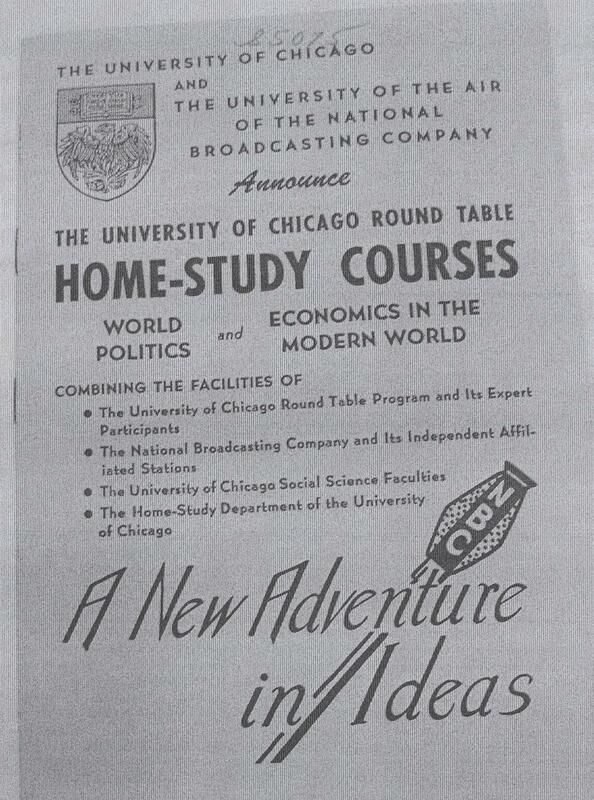 The phrase ‘A broadcasting university’ was the front page headline of The Radio Times, 3, 38, June 1924. The item was about the secondment of J C Stobart as Director of Education for the BBC and two years later he employed the term ‘wireless university’. This wireless university would ‘need require no fixed standard of entrance [and] the students would be of all ages and conditions.[iii]. I hated the term University of the Air because of all that nonsense in the press about sitting in front if the tele to get a degree. (Jennie Lee in an interview with OU alumni Les Holloway in The first ten years. A special edition of Sesame to mark the tenth anniversary of the Open University, 1969-1979, The Open University, Milton Keynes, p. 3). The original name was the University of the Air. I am glad that it was abandoned, for even the air would be too confining. We start, it is true, in dependence on, and in grateful partnership with, the British Broadcasting Corporation. But already the development of technology is marching on, and I predict that, before long, actual broadcasting will form only a small part of the University’s output. The press continued to use the name, as this Guardian cartoon of 11 January 1971 (in which a man is referring to a parachutist as a University of the Air drop out) demonstrates. [i] George Catlin ‘A University of the Air’, Contemporary Review, July 1960, pp. 358-360; Michael Young ‘Is your child in the unlucky generation?’, Where? 10 Autumn 1962, pp. 3-5. He went on to popular the term open university, in Michael Young ‘Towards an open university’ Where? 18, Autumn 1964, pp26-33. [ii] David F Noble, Digital diploma mills: the automation of higher education, First Monday, 3, 1 – January 5th 1998. [iii] Stobart to Reith 8 October, 1926 ‘The wireless university’. OU archive WP1/1/1. See Jacqueline Kavanagh, ‘The BBC’s Written Archives as a Source for Media History’, Media History, 5, 1, June 1999, p. 84. [iv] A copy of which can be found in Benton, William Papers, [Box 522, File 17] Special Collections Research Center, University of Chicago Library. [v] Benton, William Papers, [Box 522, File 17] Special Collections Research Center, University of Chicago Library. This entry was posted on Thursday, January 6th, 2011 at 8:00 am by Daniel Weinbren	and is filed under Ideas. You can follow any responses to this entry through the RSS 2.0 feed. You can leave a response, or trackback from your own site.